Oblique aerial view of Seagate Castle, looking SW.
Oblique aerial view of Seagate Castle, looking N.
Oblique aerial view of Seagate Castle, looking S.
Oblique aerial view of Seagate Castle, looking NNE. 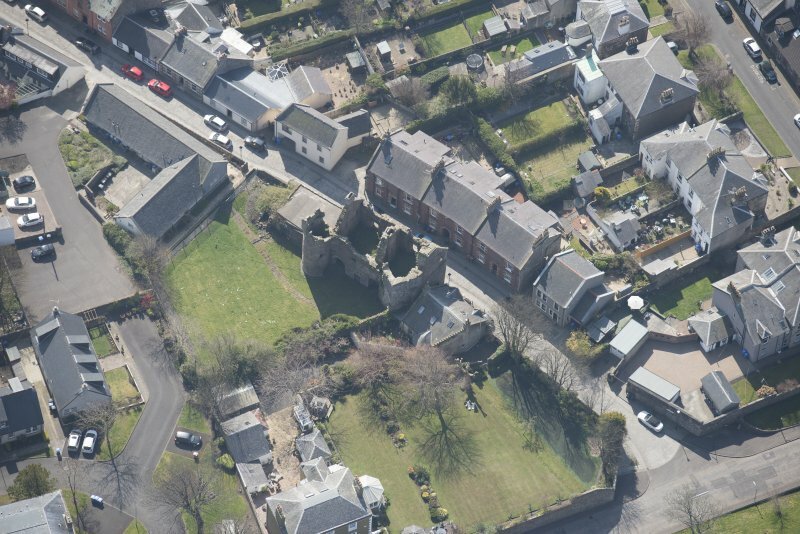 Oblique aerial view of Seagate Castle, looking SE. 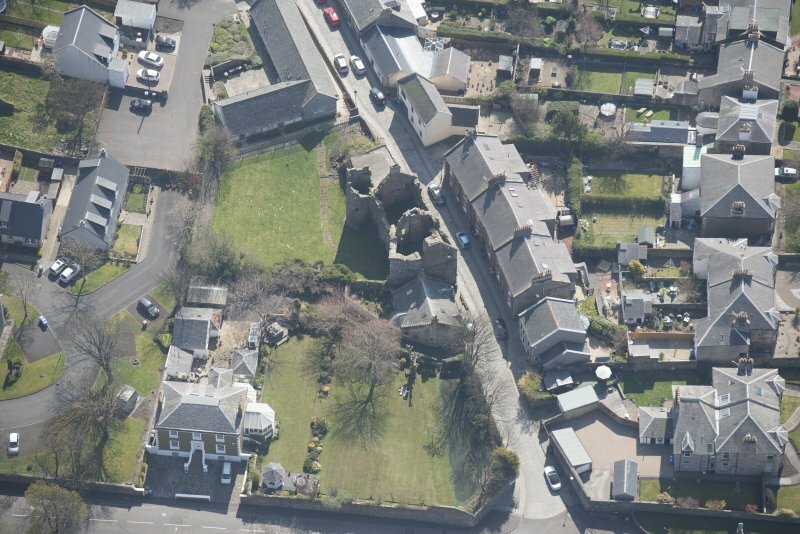 Oblique aerial view of Seagate Castle, looking WNW. 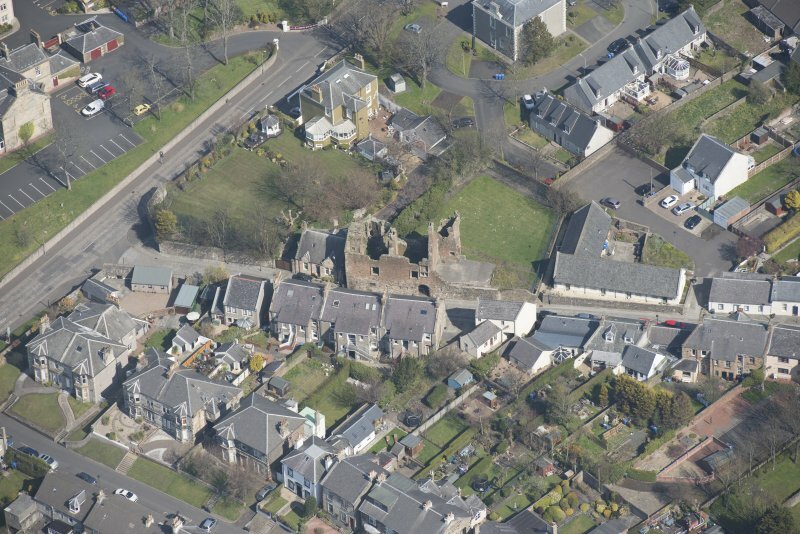 Oblique aerial view of Seagate Castle, looking NW. 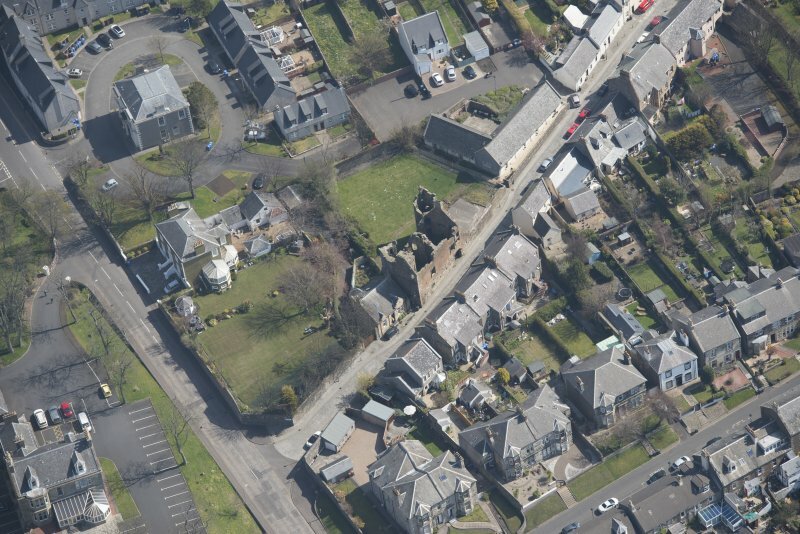 Oblique aerial view of Seagate Castle, looking NNW. 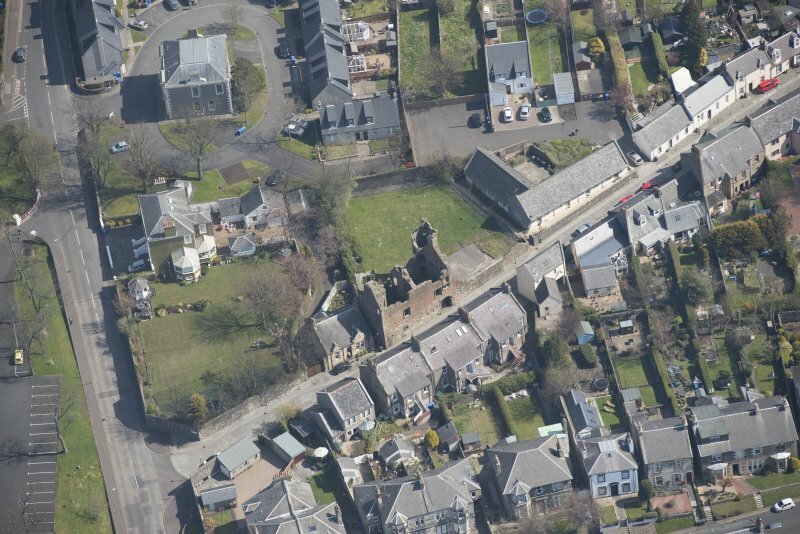 Oblique aerial view of Seagate Castle, looking NE. 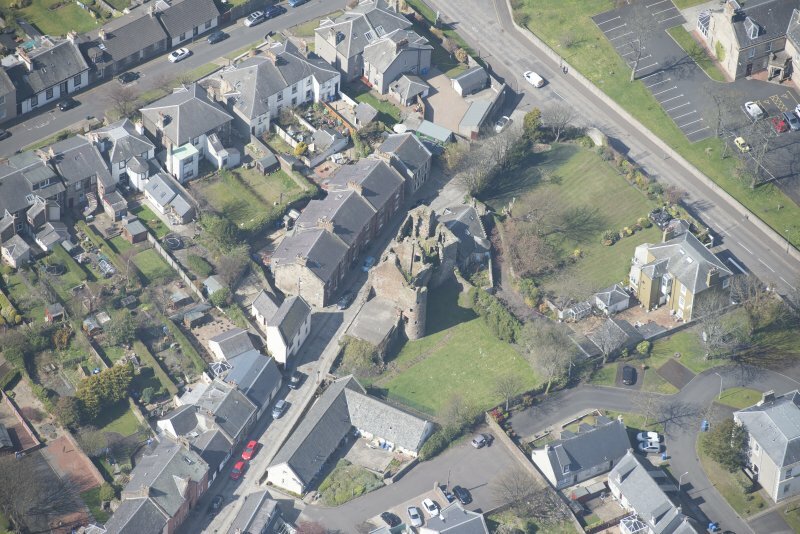 Oblique aerial view of Seagate Castle, looking ENE. 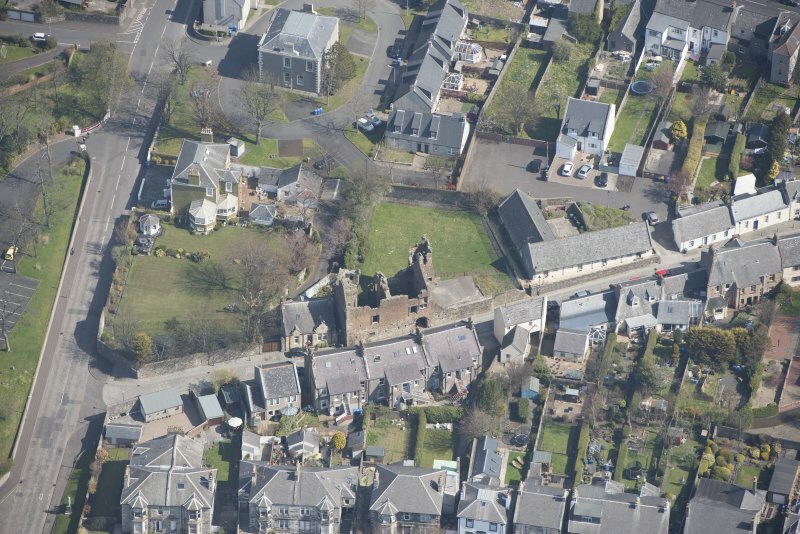 Oblique aerial view of Seagate Castle, looking W.
Oblique aerial view of Seagate Castle, looking E.
Oblique aerial view of Seagate Castle, looking SSE. For trial excavation at NS 3197 3916, see NS33NW 50. (W Galloway) that this last is part of the earlier castle, although the walls are of no great thickness. The S half of the long main block and one round tower are now reduced to the basement and foundations but the remainder is fairly entire as far as the wallhead. 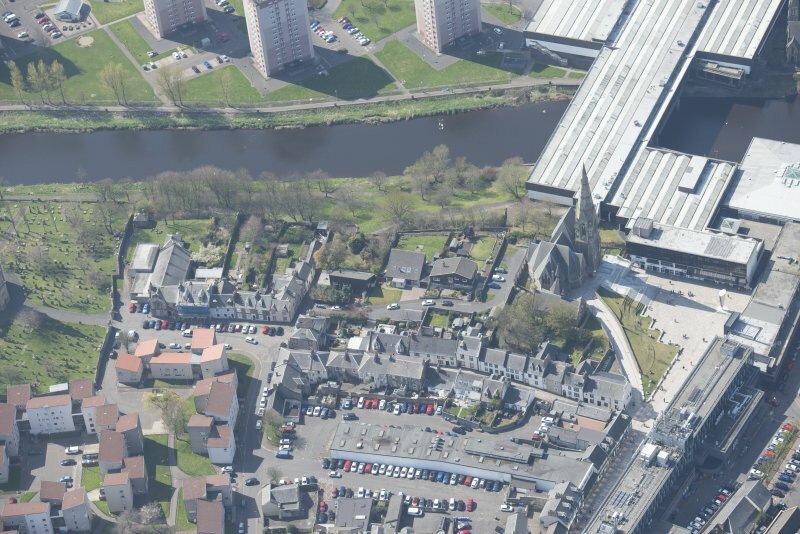 There has been a courtyard with curtain walling and subsidiary building to the E. The entrance is by a vaulted pend running through the N half of the main block. 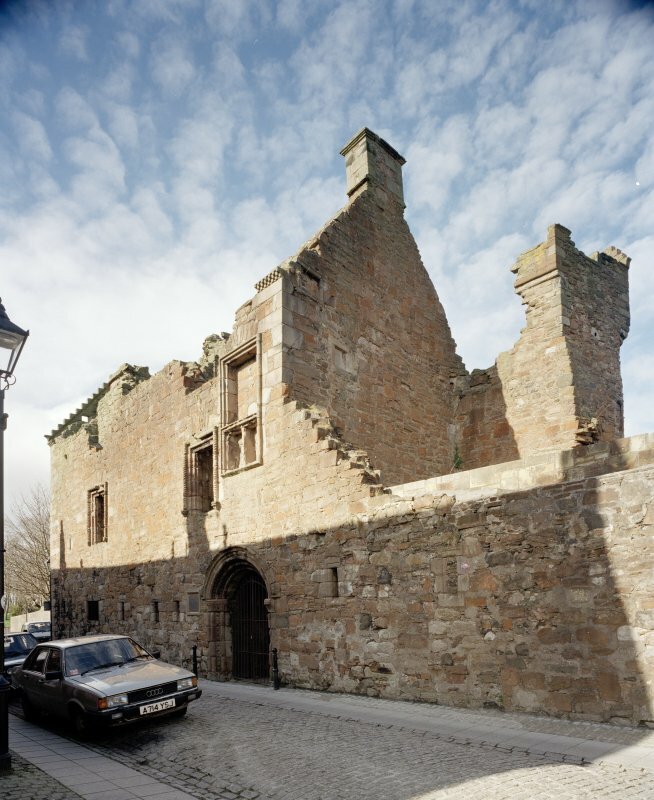 This has a fine ornamental arched doorway near which is a modern plaque stating that the treaty of Irvine was signed here in 1297. 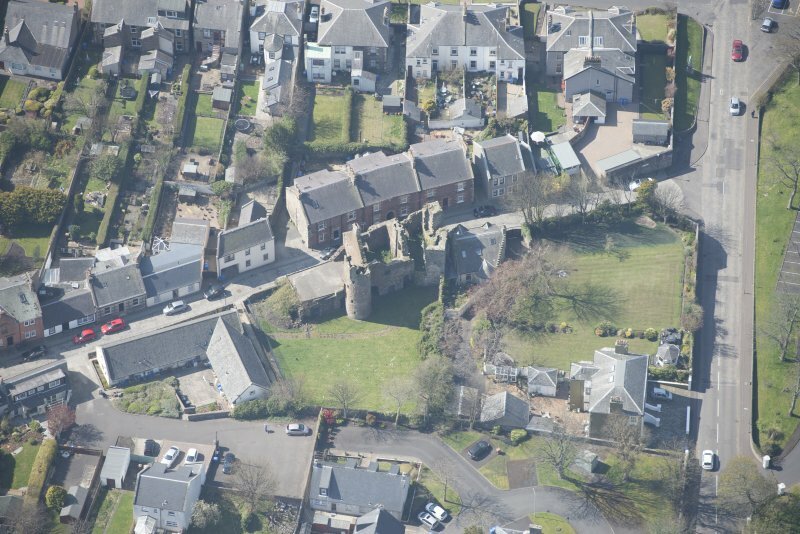 This would depend on this castle incorporating the earlier stronghold. 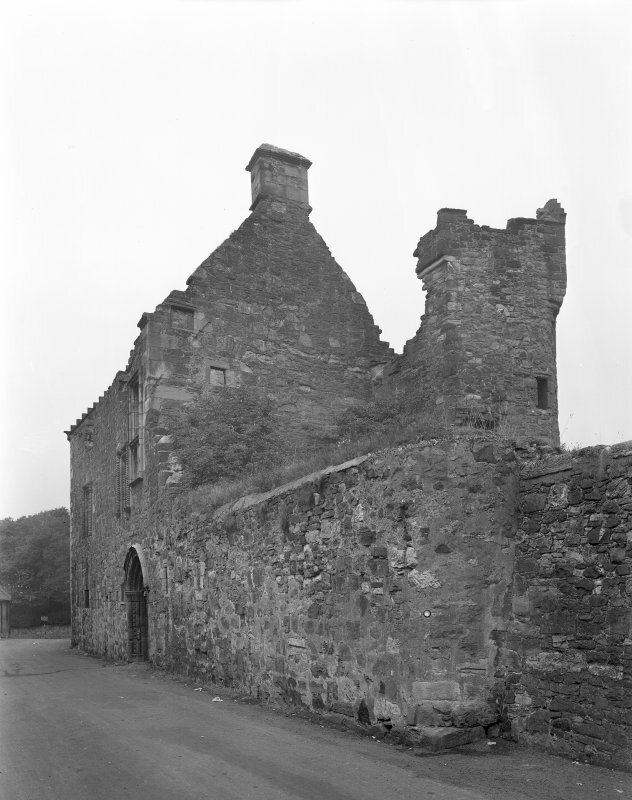 The castle was inhabited until about 1746 when its roof was removed. 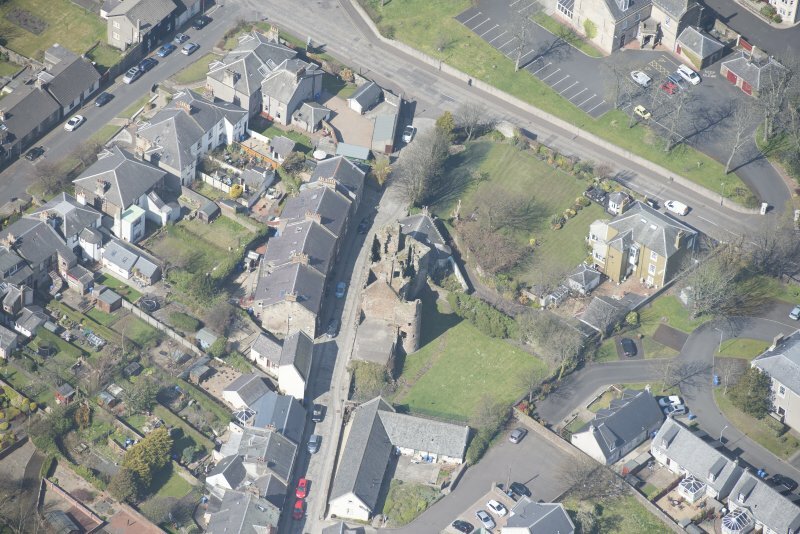 Seagate Castle is as described. No change. The castle and courtyard are closed to the public. A trial excavation was carried out in October 1992. It revealed medieval deposits to a depth of 2.8m, where natural was encountered. The only structure was a short length of wall no dating evidence. Intermittent layers of clean blown sand were found, sealing that various deposits. 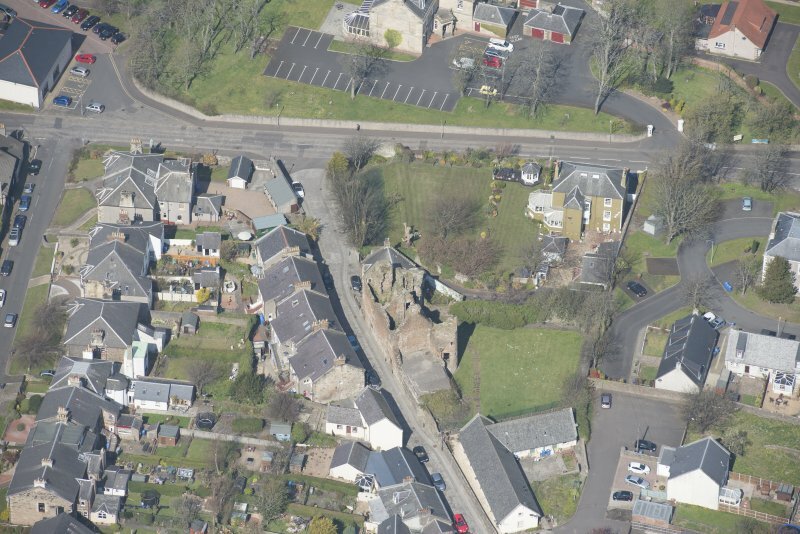 NS 3192 3915 In February and March 2000 a watching brief was carried out during the removal of damaged concrete screed above the barrel vaults at the late 16th-century Seagate Castle (NMRS NS33NW 3), the oldest surviving structure in Irvine. The corbelled stonework of the upper roof of the vault was exposed, partly overlain by post-medieval to modern deposits of levelling material, and these were recorded before a waterproof membrane and new concrete screed were laid. 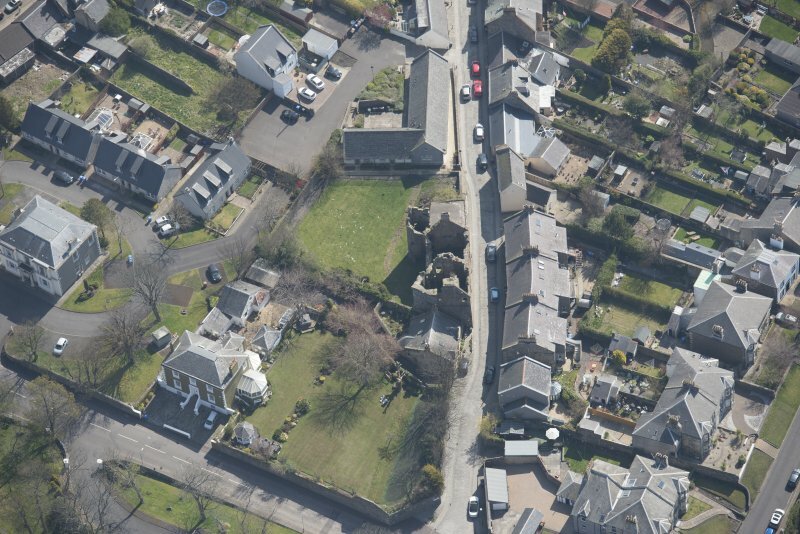 A drainage trench through the adjacent mound proved to be composed of modern dumped material, while a pit dug for a silt trap in the SE corner of the castle grounds established the presence of medieval and post-medieval cultivated soils up to 1.2m deep. Pottery dating from the 15th century was recovered from the earlier cultivated soils. (GUARD 841). Benedict of Peterborough, writing of June 1184, mentions a castle of Hirun which McJannet took to mean Irvine (1938, 91). 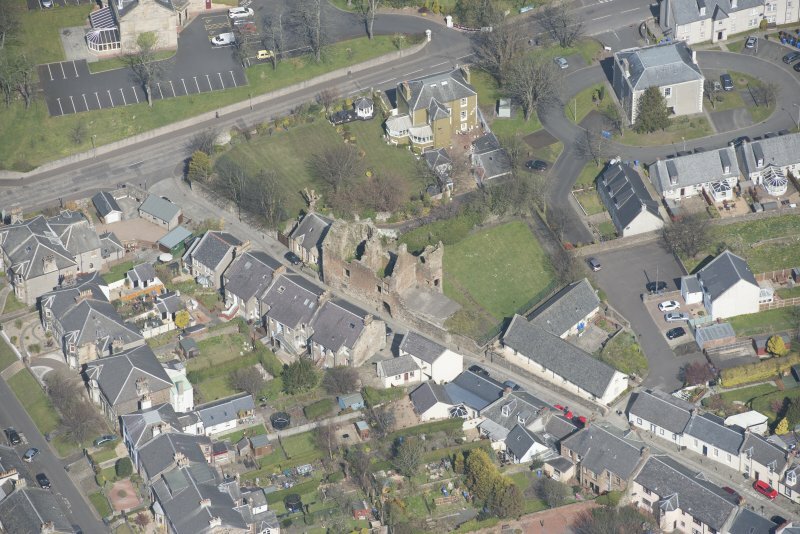 Today at Irvine there are the ruins of a late sixteenth century fortified townhouse, the so-called Seagate Castle. 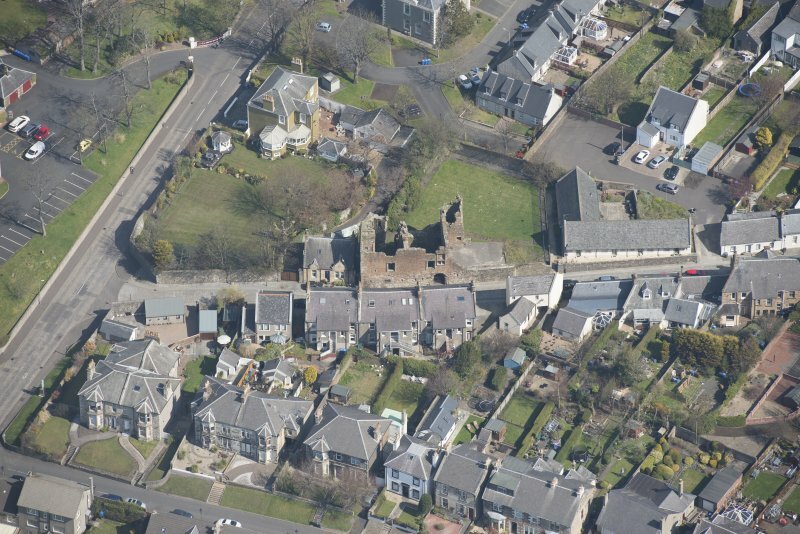 'The Seagate Castle', in the words of the editor of the burgh muniments, 'is the only remnant of the ancient civil and ecclesiastical buildings in the burgh which has survived the march of so-called modern improvement, all the others having been entirely cleared away' (Dobie, 1890, xxxii). Little is known of the history of Seagate Castle although it certainly belonged to the Earl of Eglintoun - the arms of the third earl, who died in 1585, have been embedded in the structure (MacGibbon and Ross, 1892, v, 240). 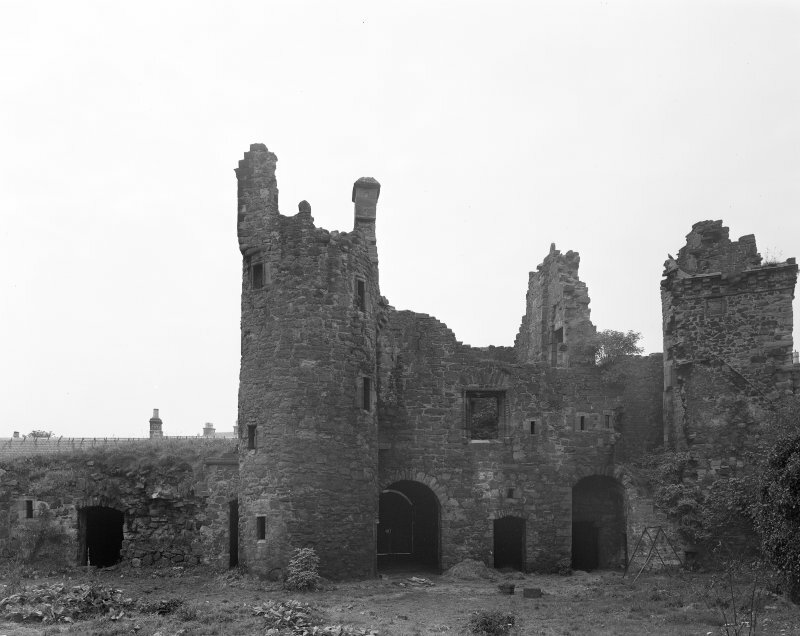 Pococke in 1760 described the structure as ruinous (Kemp, 1887, 57) and it is not clear when the castle was abandoned. 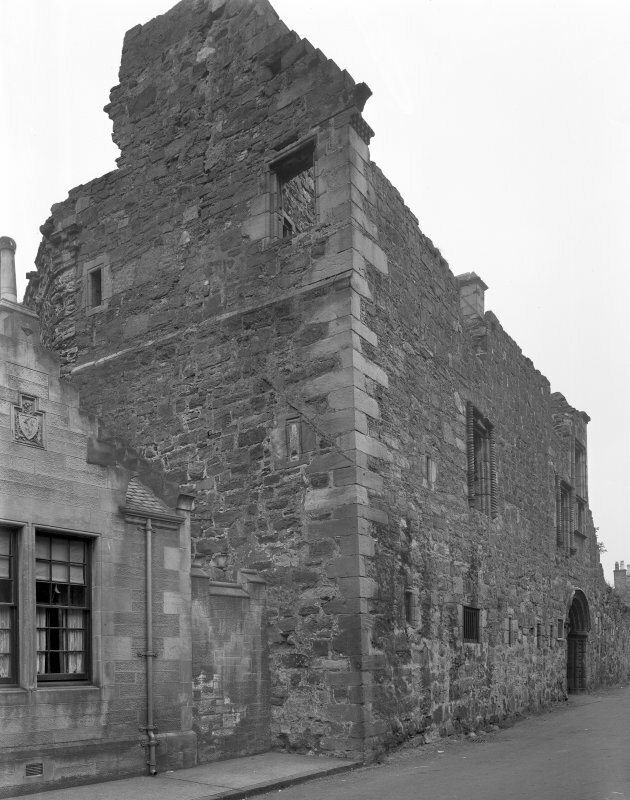 The walls of the northern portion are in fairly good condition as is the ground storey of the south end of the building, the gables and chimneys. It could possibly be on the site of an earlier work, but there is no evidence for this (Ordnance Survey, Record Cards, Reference NS 33 NW 3). 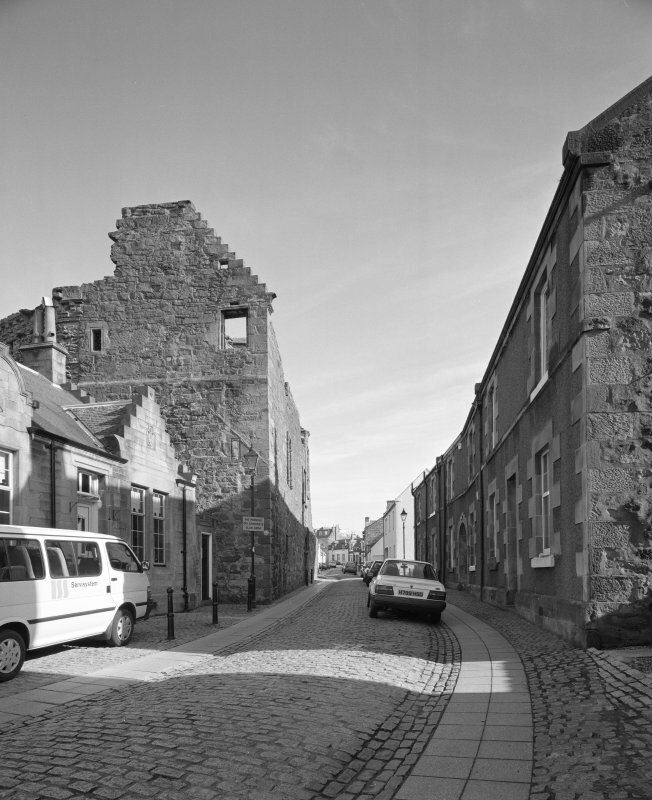 Information from ‘Historic Irvine: The Archaeological Implications of Development’ (1980). NS 319 391 A watching brief was undertaken 7 March – 11 April 2012 during repair and conservation of the building fabric of Seagate Castle and removal of vegetation. The stump removal works indicated that all the trees had been rooted in a mid-brown silty deposit. A single test pit excavated in the SE corner of Chamber A established that the silty deposit was 300mm deep and that it overlay a 100mm deep mortar-like deposit. The mortar-like deposit lay directly above the vaulted ceiling of the underlying pend. A single sherd of late 15th- to 16th-century medieval green glaze pottery was located adjacent to a small flight of stone steps uncovered in Chamber B.